Crazy Prop Bet: For $100k, Would You Stay in a Dark Room without Human Contact for 30 Days? Tags: Danielle Andersen, DMoonGirl, prop bet. Posted on Wednesday, November 28, 2018 by "T". We all know that crazy prop bets tend to be quite common in the world of poker players. While some were made just for bragging rights and some were made for a good cause (like better health), there will be some that's going to be plain crazy just to make some bucks. A good example of the latter would be this latest crazy prop bet posted on Facebook by Danielle "DMoonGirl" Andersen. The prop bet was later on copy/pasted in the 2+2 Forums by Allen "Chainsaw" Kessler (known online as doublejoker), and it says a poker player agreed on a prop bet that specifies he must live in a dark bathroom for a full 30 days. The bet is 50:50 - if he accomplishes the task he wins $100,000, but if he fails then he's going to have to shell out the same amount. Stay in a dark bathroom with no human interaction for 30 days. He will have a refrigerator (with no light), will have ample food/water. He'll have towels, toiletries, bed/pillow, a paddleball, bubble bath & Rubik's cube? If he stays in the room the full 30 days, he wins 100k. If he gives up, it costs him 100k. Who's the brave soul, you ask? Well, the poker player's identity remains anonymous, since Andersen said she's not certain that he wishes to be named in public. Many people commented on Andersen's prop bet both on Facebook and the TwoPlusTwo thread, expressing their sentiments regarding the mental health risks this bet would cause to a person. Also, many think that the odds of 1:1 isn't a very good deal at all for the guy who will be subject to the solitary confinement plus no light for 30 days. Some pointed out this prop bet is definitely not comparable to what Jaime Staples and his brother went through. As Punter11235 said in the forum, "This is not comparable. If you are fat, losing weight is likely beneficial for you even if you don't eat anything until you get there. It's pretty safe unless you have pre-existing conditions already. Even if you do that with (reasonable) help of drugs you are still better off at the end of the bet as being fat is bigger health risk than few months of cocaine or amphetamines not to mention other life quality benefits. The only problem is that one of them had to fatten up to win it, other than that it's healthy motivating competition, they could have arranged it for the fat one to lose more weight though. In OP though you are wasting 30 days of your life to be guaranteed worse off health wise at the end of it not to mention some risk of lasting damage. It's basically "cut your finger off and I will give you 100k" kind of deal. I think the chances of him making it though are reasonable. I wouldn't bet on him 1-1 but freaks who agree to those deals often have amazing amount of will power and sheer persistence." Nolan Dalla commented on Andersen's Facebook post, "There's nothing either appealing or entertaining or intriguing about this unless one enjoys wagering on acts of torture and potential mental deformity." 2013 World Series of Poker Main Event champ Ryan Riess wrote, "Drawing dead". 2016 WSOP Event #7 winner Ryan D'Angelo said, "I would be shocked if he lasts a week." Despite the long list of comments saying the same outcome that the person will not be able to accomplish the feat, Andersen said, "Unconfirmed, but I've heard the individual has participated in some long, silent meditation retreats before. I think this increases his chances of success but I still think he's an underdog." What do you think about this prop bet? 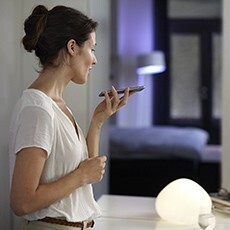 Will you be able to survive 30 days in a dark bathroom with no light and human interaction? And would you do it for $100,000? 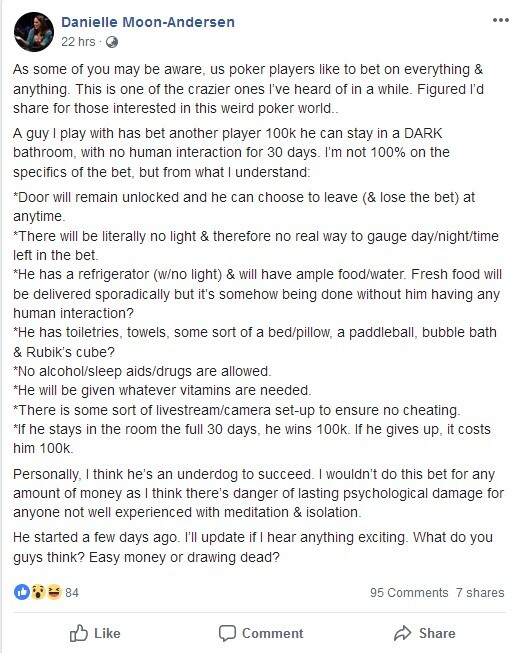 11 comments for "Crazy Prop Bet: For $100k, Would You Stay in a Dark Room without Human Contact for 30 Days?" 30 days without human interaction? Easy. But 30 days in the dark without a computer, a TV or even books? No way. May sound easily doable, but i guess most people would give up way before the 30 days are reached. It is more a prop bet for a bear, it would simply sleep for that time. its interesting bet!at this points I wouldnt take offer,but if I really need money,then I would!this is ok situation,only thing that I would need is mobile phone!you can eat,sleep,take a shower,everything,but just to sleep and do it nothing is tough for 30 days! You can say staying in a dark bathroom for a whole month can be done. He is going to have everything he needs for the whole duration of the bet. I hope this poker player who accepted this challenge, do not get sick with claustrophobia. If this thing happens, then he will regret it. Is a weird bet and to sit in the dark one month, it's not so good for a human's health. People who risk money for amusement and people who make bizarre things for money. Sure, why not. I would probably do it for 50k as well. 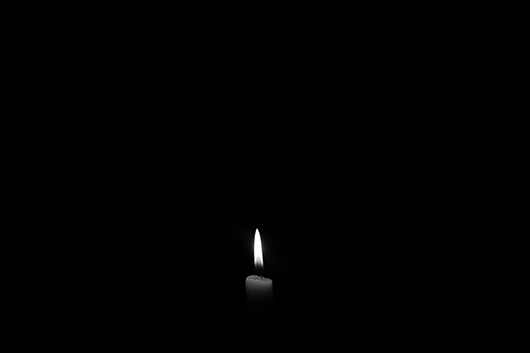 The problem is not being alone in the dark and so on but to be entertained enough by yourself for the hours you will spent being up and not sleeping, eating etc. There are worse things happened with prisoners elsewhere and they survived unscathed too. dam thats a easy 100k and not just saying that, i have some experience. It sounds easy indeed, but i doubt it is. I dont think i could ever make it to the end of it. Your psychology after this must be terrible, and the parameters for it must be plenty. Loss of sight, loss of time, for example, for all that period alone are not easy to overcome.